Pilosella aurantiaca is similar to Pilosella officinarum but more robust and with brick-red or orange-red flower heads. A garden escape which can persist for a few years only on gravelly soils on roadsides etc. Some botanists distinguish two subspecies (formerly species), but the differences are probably insignificant. All names: Pilosella aurantiaca (L.) F.Schultz & Schultz-Bip. 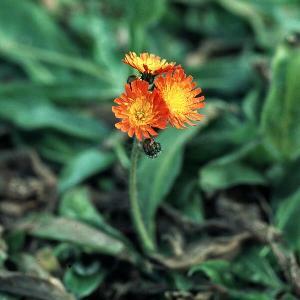 ; Hieracium aurantiaca L.